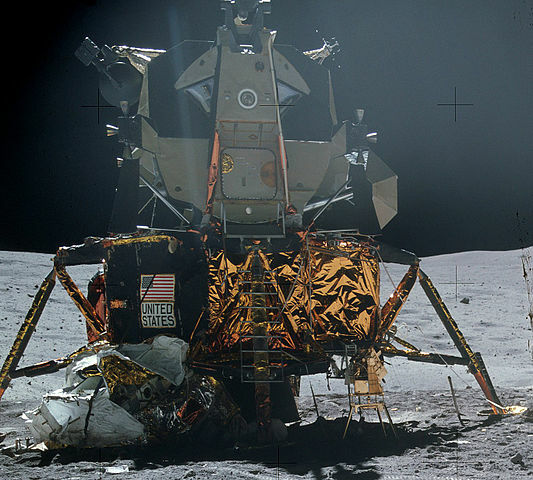 The goal of these exercises is to control a primitive version of an Apollo lander and land on a target on the Moon using vertical and horizontal thrusters. The three thrusters can provide a constant force in the +x+x, −x−x, and +y+y directions, respectively. Only one thruster can be engaged at a time. Besides modeling the motion of the Apollo lander, the exercises are a “game” in which the user attempts to control the lander and meet the challenge of landing on a given target with minimal speed. This exercise is named after a late-70s Atari game called Lunar Lander. By employing thrusters in the +x+x, −x−x, and +y+y directions that are aligned with the center of mass of the lander, we do not have to consider rotation. The goal is to control the spaceship using brief impulses. For simplicity, the first two exercises neglect mass loss due to fuel exhaust and are appropriate for introductory students. In Exercises 3-5, students incorporate fuel burn rate. Exercise 5 is intended for intermediate level students who can derive an analytic solution for the y-velocity of a rocket with constant fuel burn rate in a constant gravitational field and can compare numerical and analytic solutions. Students should view a landing rocket such as the landing of a SpaceX CRS-8 first-stage rocket booster on a floating drone ship. Students may also want to play the original Atari Lunar Lander game. Because keyboard interactions are essential to Exercises 1-4, a minimal working program is provided in which the keyboard interactions work, but the lander travels with constant velocity. 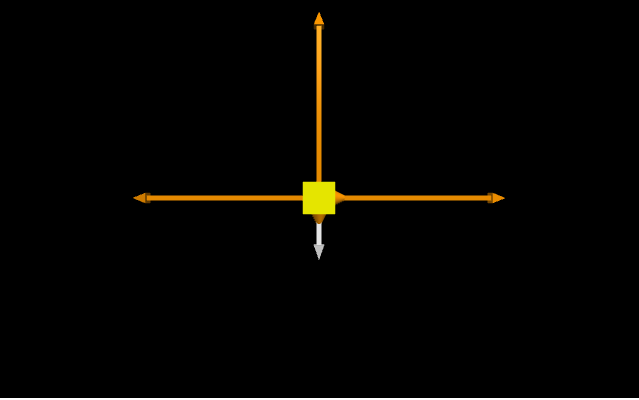 Students must add the appropriate code inside the while statement to correctly compute the velocity of the lander. The attached programs are written in GlowScript and require a free account at GlowScript.org. You will model the motion of a lunar lander and then control the lander so it lands on a given target on the Moon. At first, you will neglect fuel loss. However, this is not realistic, so in later exercises you will include it. Our lunar lander has similar mass and thrust as the Apollo lander, but that’s where the similarities end. A free-body diagram showing all thrusters engaged simultaneously along with the gravitational force by the Moon is shown below. However, we will assume for these exercises that thrusters cannot be engaged simultaneously. After completing the exercises, you are welcome to explore additional features of your model, such as allowing simultaneous thrusters for example. <0,0,0><0,0,0> if no engines are firing. Fthrust<1,0,0>Fthrust<1,0,0> if a thruster exerts a force to the right. 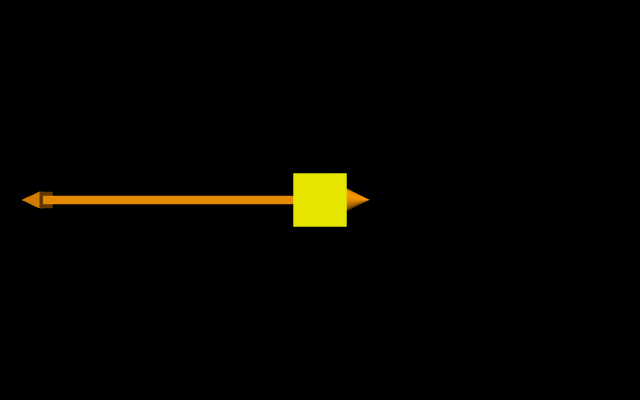 Fthrust<−1,0,0>Fthrust<−1,0,0> if a thruster exerts a force to the left. Fthrust<0,1,0>Fthrust<0,1,0> if a thruster exerts a force upward. where dmdtdmdt is the fuel burn rate in kg/s and is negative. For the special case of a vertically descending or ascending rocket with thruster engaged, an analytic expression for the y-velocity of the rocket can be derived. An analytic calculation can be compared to the numeric calculation for this special case in order to test the computational model. Your goal is to control the lander and land on the target within the safe landing speed and within the safe landing zone. It is best to use keys on the keyboard to turn on or off the thrusters. Define the position of the lander as its center of mass (CM) position. Define “landing” as when the bottom of the lander reaches the surface of the Moon. Thus, if the lander starts at y=50y=50 m and lands with the CM at 1.5 m, then its displacement is actually 48.5 m.
Add two engines in the ±z±z directions. Use the following initial conditions for the lander. Repeat the challenge of landing on the target within the safe landing zone and safe landing speed. You will need to define two more keys to control the two additional engines. Suppose that the burn rate of fuel dm/dtdm/dt is constant and non-zero. This represents the change in mass of the system (lander structure and fuel) per second as an engine is firing. Edit your simulation to include a burn rate of −500−500 kg/s. If the lander burns all of its fuel, be sure to make the thrust zero. To make the game more interesting, you can increase the absolute value of the burn rate and see if you can land within the safe limits before running out of fuel. As thrusters fire in various directions while you control the lander, does the magnitude of the gravitational force on the lander increase, decrease, or remain the same? Explain your answer. Suppose the vertical thruster is constantly firing for a long time. As it is firing, does the y-acceleration of the lander increase, decrease, or remain the same? Explain your answer. Create a graph to plot either FgravFgrav or ayay as a function of time. Check your answers to the questions in Exercise 3 by viewing the graph as you operate the lander. Explain whether your answers in Excercise 3 were correct or incorrect and how you determined this. For the simple case of a lander traveling vertically using only its vertical thruster as it lands, you can derive an analytic function for the lander’s y-velocity as a function of time. Use the following initial conditions for the lander. If the vertical thrust is constant and is engaged during the entire vertical descent, what is the y-velocity of the lander when it hits the surface of the Moon? Solve the problem analytically. Then, simulate it. Compare the numerical result to the analytic result. What is the necessary minimum speed of the rocket at its initial position y=50y=50 m so that firing its vertical thruster for the entire descent will cause the rocket to land with nearly zero velocity? Define the position of the lander as its center of mass (CM) position. Define “landing” as when the bottom of the lander reaches the surface of the Moon. Thus, if the lander starts at y=50 m and lands with the CM at 1.5 m, then its displacement is actually 48.5 m.
Add two engines in the ±zdirections. Use the following initial conditions for the lander. Suppose that the burn rate of fuel dm/dt is constant and non-zero. This represents the change in mass of the system (lander structure and fuel) per second as an engine is firing. Edit your simulation to include a burn rate of −500 kg/s. If the lander burns all of its fuel, be sure to make the thrust zero. To make the game more interesting, you can increase the absolute value of the burn rate and see if you can land within the safe limits before running out of fuel. Create a graph to plot either Fgrav or ay as a function of time. Check your answers to the questions in Exercise 3 by viewing the graph as you operate the lander. Explain whether your answers in Excercise 3 were correct or incorrect and how you determined this. 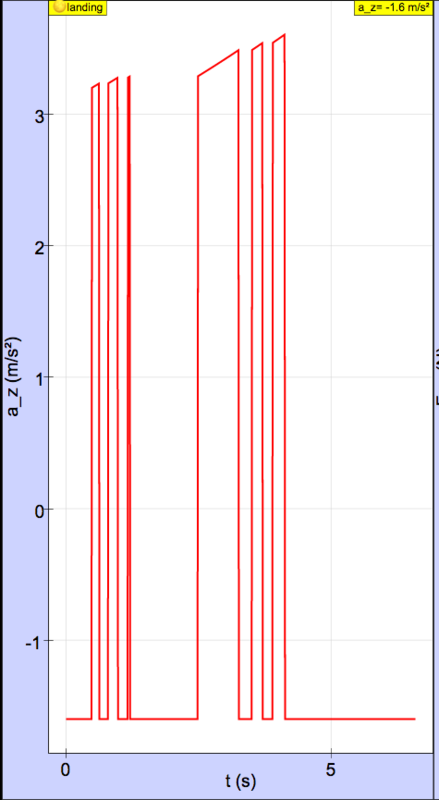 What is the necessary minimum speed of the rocket at its initial position y=50 m so that firing its vertical thruster for the entire descent will cause the rocket to land with nearly zero velocity? There is no right answer, except having a working program and controlling the lander so it lands within the target and within the safe landing speed. 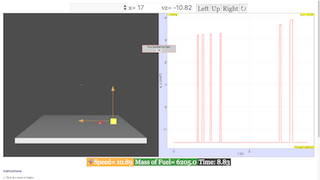 Students should be encouraged to play with the simulation and add game-like elements to it. Landing within the safe landing speed (less than 1 m/s) is fairly difficult. In the code template, there is a function def process(event) that handles keyboard interactions. 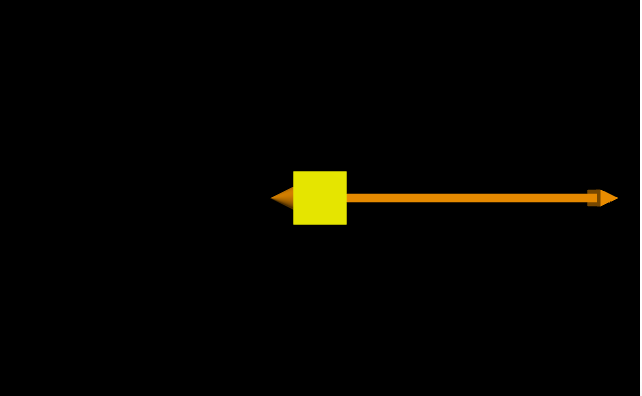 There is a commented line to print the key when it is pressed, as shown below. If this line is uncommented, then you can type any key and get its associated integer. Choose two other keys, like “a” and “s” for example, and edit this function. In addition, you will want to add cones (for fire) and arrows for the thrust vectors in the z direction. It is best to add a graph so you can see how variables such as mass, gravitational force, and acceleration change as thrusters are firing. The gravitational force on the lander decreases as thrusters are firing due to the loss of mass. As mass decreases due to fuel loss, the denominator decreases less than the numerator decreases. As a result, the fraction increases. Here is a graph of Fgrav,yFgrav,y vs. time. During the flat parts of the graph, the thruster is off. During the upwardly sloped part of the graphs, the vertical thruster is firing and the lander is losing mass. Here is a graph of ayay vs. time. Each peak corresponds to the vertical thruster firing. It increases as the thruster fires. The flat parts correspond to the engine being off (free-fall). The y-acceleration in free-fall is constant even though the lander loses mass because mass cancels. where vexhaust=∣∣∣F⃗ thrustdm/dt∣∣∣vexhaust=|F→thrustdm/dt| is the exhaust speed of the fuel. With the given initial conditions, the landing speed of the lander computed numerically is 7.000 m/s or 7.17 m/s (Runge Kutta 4 solver in EJSS) and computed analytically is 7.048 m/s. A graph of y-velocity computed numerically (blue) and analytically (red) is shown below. Because the curves overlap, the numerically determined curve is not seen. To land with a landing speed less than 1 m/s, the initial y-velocity at a height of 50 m must be -18.88 m/s or -18.86 m/s (Runge Kutta 4 solver in EJSS) . Chapter 3 in Classical Mechanics by John R. Taylor (University Science Books, 2005).